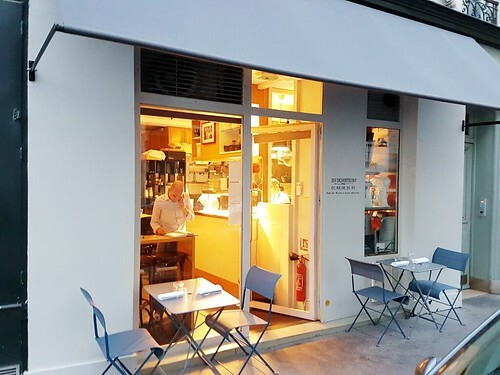 The cuisine is mixing elements of bistronomy with its wild creativity and sometimes unusual ingredients with ultra-classic fine fining craftsmanship. Meaning: the sauces are as elaborated as you would expect them in a 3 star Parisian palace. But the Leitmotiv clearly is to focus on great ingredients. Daniel Baratier is very product-driven and choses high-end ingredients sourced from trustworthy partners in different French regions. And the incredible thing about it. You get a 6 course tasting menu at 60 Euro! We’re talking about a restaurant at star-level here (for incomprehensible reasons, Les Déserteurs hasn’t obtained a star yet). What a bargain! 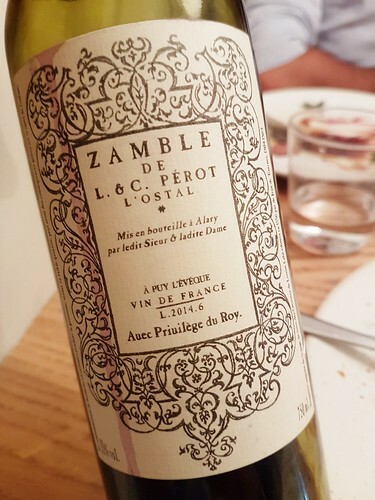 Of course, I shouldn’t forget to mention Alexandre Céret, Daniel’s partner and acclaimed sommelier of the restaurant who curates a great wine list with lots of variety and always recommends original and suitable wine pairings. 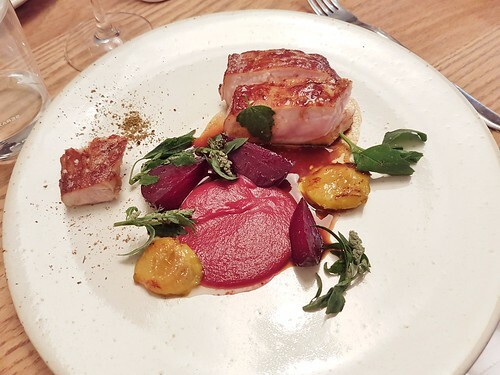 So let me take you through our meal at Les Déserteurs. 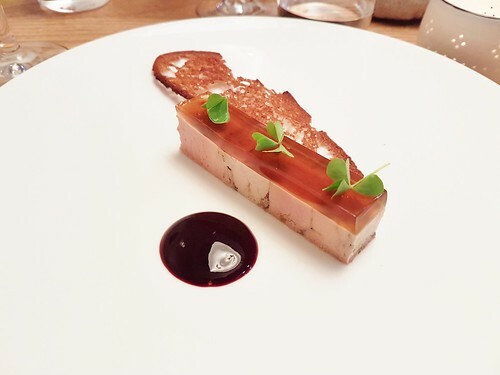 Terrine de foie gras de canard avec sa gelée à l’amontillado 30 ans d’âge, myrtilles sauvages lacto-fermentées et dentelles de blé pop’. 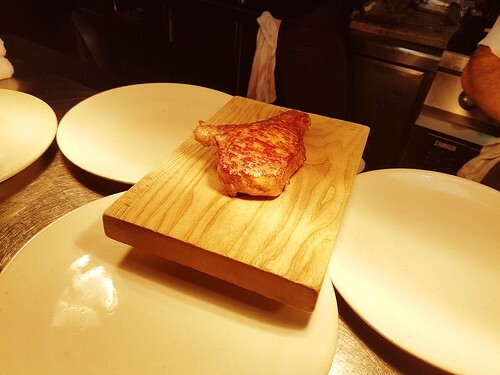 The foie Gras itseld is very carefully cooked and well-defined. 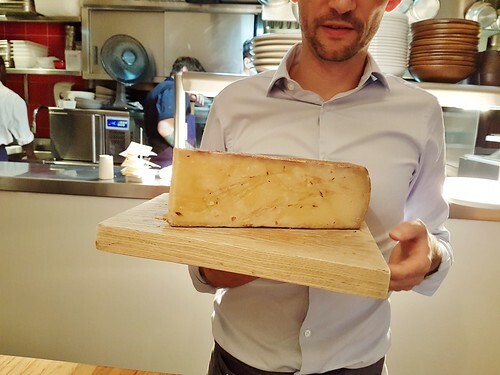 It is paired with a gelée of Amontillado Sherry on top of the foie gras, adding a sort of nutty sweetness and blueberry, which is contained in the very dark dot of sauce. The sauce is thick and has a very deep flavor. It nearly appears savory so that you could mistake it for demi-glace or some kind of meat extract with a fruity touch. It is ironical that the amontillado gelée tastes sweeter than the blueberry. Well played, Monsieur Barratier! You fooled our palate! This is a very original and tasty rendering of a foie gras dish. Not the usual sweet and savory contrast, but something much more refined. The foie was paired with a dry furmint of the Tokaij region. Not a sweet wine as you would expect for such a pairing. Well played, Monsieur Céret, our senses are being fooled again. What a thought-through pairing as both the dish and the wine are playing tricks on us. Both are appearing much drier than you would expect it! 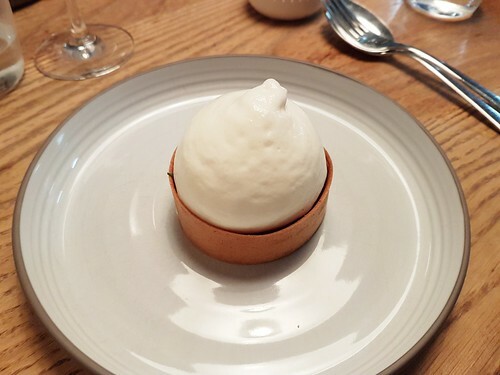 Oeuf bio de la ferme de la Bigottière, condiment de vrai champignon de Paris, infrutescence de plantain, epi de mais et baies de sureau noir de Salmondèche. Lots going on on this tiny plate. It’s very interesting how Baratier manages to combine fruity elements such as elder berries with savory elements such as an egg. Somehow the corn with its slight sweetness creates a bridge between the two. 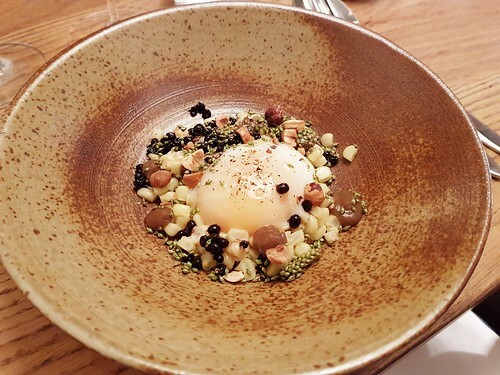 And there’s structural contrast in this plate as well through the confrontation of creamy egg yolk with crunchy grains. Lieu jaune de ligne de Saint-Gilles-Croix-De-Vie, coco de Paimpol, grémolata, poudre de âches de montagnes, cresson de jardin et émulsion de fleur de carotte sauvage. 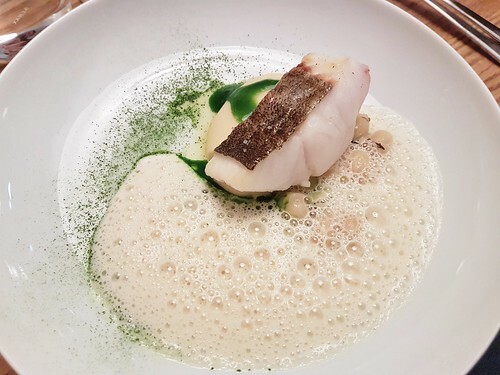 It’s crazy how many ingredients are contained in this dish of line-caught pollock, yet it tastes just so pure and subtle. There’s lovage powder that just doesn’t carry this sometimes too prominent lovage flavor, it just adds a slight herbal bitterness, like tea powder. The coco beans add richness in a very natural way. Regarding carrot flower, I admittedly still have no clue how it tastes after eating the dish. But this was a great course, again! 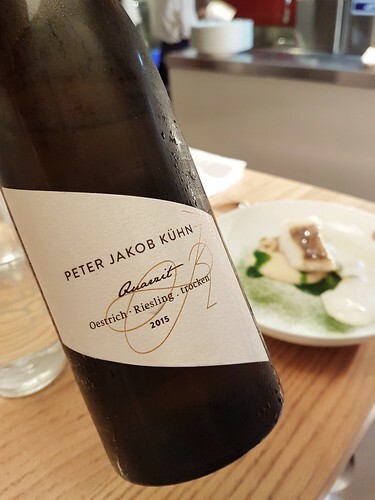 The pollock was paired with a glass of -surprise!- German wine, which is a very unusual thing for France and Paris and shows just how unpretentious and liberated spirits they are at Les Déserteurs. La côte de veau de lait de Sauxillanges par Ludovic (+20€), mousseline de betterave aux baies de Timut et quartiers rôtis, pousse de chénopode, Reine Claude caramelisée. My friend Laurent and I gladly accepted to share the last avaible milk veal rib as a replacement of the duck in the main course (extra 20€) and it was clearly worth it. The meat was so juicy and tender and with great aroma. The beet puree was flavored with timut pepper which gave it an oriental touch, which reminded a bit of cinnamon or 5-spice in flavor. I also loved the acidic and fruity addition of the beautifully roasted reine claude. And of course, the sauce, which comes separately in a tiny pot, is just perfection. The veal was paired with a wine from South-West France made out of the Tannat varietal. I know these wines for being extremley structured and very tannic. This one though appeared nearly as silky as fine burgundy and combined bright fruit notes with a very welcome freshness. A discovery. I think the winery is called L’Ostal and still is quite unkown. Some cheese before dessert? Well if it looks like this. Of course! Jeune Comté bio due Jura affiné à la flouve odorante. Figues de Solliès légèrement pochées, mendiant, crème glacée à la feuille de figuier et tuile au sucre de muscovado. The first dessert. A combination that seems simple a first sight, but in particular adding a figs leaf ice cream to poached figs is a genius idea. Great dessert pairing. 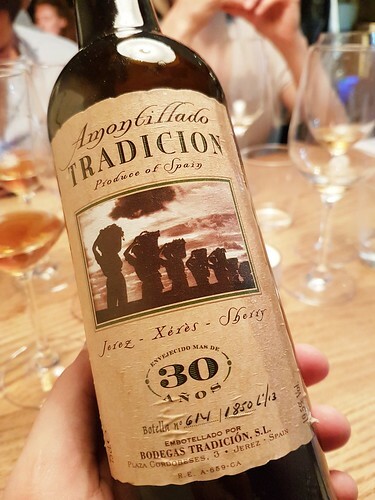 A 30 year old Amontillado sherry. “Les mûres sauvages du Morbihan” cigarette, feuille de tagète, sorbet cacao et mousse de lait réduit. 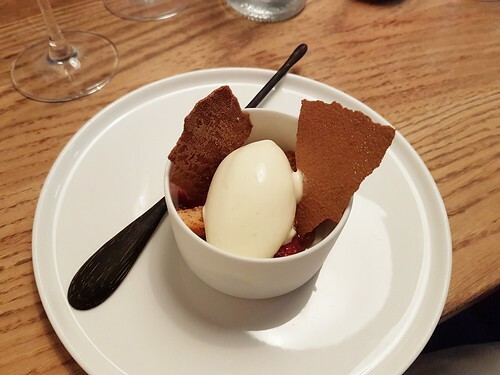 Under the firm foam of reduced milk you will find delicious wild blackberries and chocolate sorbet. This was delicious! And a glace of luxurious Pineau des Charentes for ending the meal. 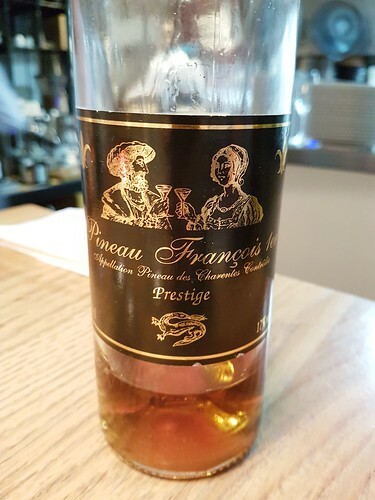 This is the prestige version of the Francois 1er Pineau which is being matured for 40 years. There’s not much of a conclusion to add to this post, as the pictures very much speak for themselves. And it really tasted as good as it looked. I urge you to go have a meal at this great tiny place. The article you have shared here incredibly heavenly. I genuinely like and esteemed your work. I read significantly your article; the concentrations you have indicated in this article are useful. This one however seemed almost as luxurious as fine burgundy and joined splendid organic product notes with an exceptionally welcome freshness. A disclosure. I think the winery is called Stall’s and still is very unknown. timeout pepper which gave it an oriental touch, which helped a bit to remember cinnamon or 5-zest in season. I likewise cherished the acidic and fruity expansion of the perfectly broiled Reine Claude. j’avais un grand honneur car j’ai visité ce blog.